Researchers analyzed outcomes through 3 years after bioresorbable vascular scaffold implantation. Of the2008 patients with coronary artery disease included in this study, a total of 1322 were randomly assigned to receive BVS and 686 were randomly assigned to receive EES. The presence of target lesion failure at 1 year comprised the primary study end point. All revascularization, ischemia-driven target vessel revascularization, and 1-year angina rates represented the secondary end points. Approximately 13.4% of patients who received BVS met the primary composite end point of target lesion failure at 3 years vs 10.4% of patients who received EES (P =.06). Investigators also observed a significant increase in target vessel myocardial infarction in patients who received BVS vs EES at 3 years (8.6% vs 5.9%; P =.03). In addition, device thrombosis occurred more frequently in the BVS-assigned group vs the EES group (2.3% vs 0.7%; P =.01). The investigators noted that the secondary end points included in the ABSORB III trial were not adequately powered; therefore, these end points should be considered hypothesis-generating only. In addition, the investigators concluded that the current 3-year follow-up period for this trial is insufficient to provide conclusive data regarding the effect BVS has on patient outcomes. 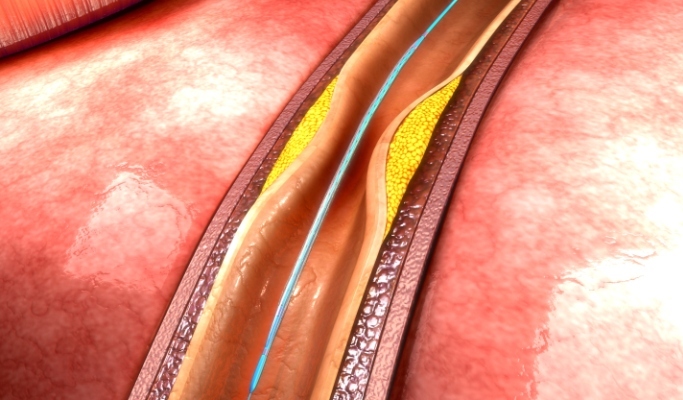 Based on the additional evidence from this trial, the investigators noted that BVS implantation should most likely be avoided in very small vessels, to allow for “maximal scaffold expansion” to improve outcomes in patients who undergo device-related treatment for coronary artery disease. Kereiakes DJ, Ellis SG, Metzger C, et al; for the ABSORB III investigators. 3-year clinical outcomes with everolimus-eluting bioresorbable coronary scaffolds: the ABSORB III trial. Presented at: TCT 2017 Meeting. October 29-November 2, 2017; Denver, CO.